The SafetyNet Attestation API is an anti-abuse API that allows app developers to assess the Android device their app is running on. The API should be used as a part of your abuse detection system to help determine whether your servers are interacting with your genuine app running on a genuine Android device. The SafetyNet Attestation API provides a cryptographically-signed attestation, assessing the device's integrity. In order to create the attestation, the API examines the device's software and hardware environment, looking for integrity issues, and comparing it with the reference data for approved Android devices. The generated attestation is bound to the nonce that the caller app provides. The attestation also contains a generation timestamp and metadata about the requesting app. Act as a stand-alone anti-abuse or app-security mechanism. Please use it in combination with the published best practices for app security and your suite of product-specific anti-abuse signals. Function when the device isn't connected to the internet. The API returns an error in such scenarios. Have its response interpreted directly in the calling app. Move all anti-abuse decision logic to a server under your control. Provide fine-grained signals about system modifications. The API offers boolean values that express different levels of system integrity. Contain signals for app-specific use-cases, such as device identifiers, GPS emulation status, and screen lock status. Replace or implement strong DRM checks. Purely to check whether the device is rooted, as the API is designed to check the overall integrity of the device. The SafetyNet Attestation API receives a call from your app. This call includes a nonce. The SafetyNet Attestation service evaluates the runtime environment and requests a signed attestation of the assessment results from Google's servers. Google's servers send the signed attestation to the SafetyNet Attestation service on the device. The SafetyNet Attestation service returns this signed attestation to your app. Your app forwards the signed attestation to your server. This server validates the response and uses it for anti-abuse decisions. Your server communicates its findings to your app. Note: To see an Android app that contains a complete implementation of the SafetyNet Attestation API, see the SafetyNet API sample on GitHub. Go to the Library page in the Google APIs Console. Search for, and select, the Android Device Verification API. The Android Device Verification API dashboard screen appears. If the API isn't already enabled, click Enable. If the Create credentials button appears, click on it to generate an API key. Otherwise, click the All API credentials drop-down list, then select the API key that's associated with your project that has enabled the Android Device Verification API. In the sidebar on the left, click Credentials. Copy the API key that appears. Use this API key when you call the attest() method of the SafetyNetClient class. After creating this API key, join the SafetyNet API clients mailing list. Important: The default quota allotment (per project) for calling the SafetyNet Attestation API is 10,000 requests per day. Read through the provided documentation for this API. Requests that don't conform to recommended best practices may be rejected. Fill out the quota request form. Wait for a confirmation email that indicates when your request has been processed. You can usually expect your request to be handled within 2-3 business days. After getting your increased API quota provisioned, set up quota monitoring and alerting. 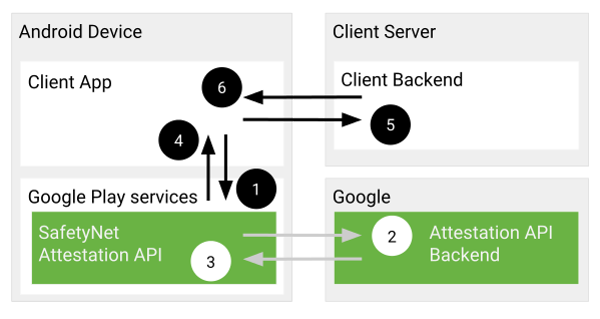 This step helps you become aware that you're running out of API quota, which could happen as your service's use of the SafetyNet Attestation API grows over time. Note: Regardless of the quota provisioned for your project, individual app instances are throttled to a maximum of 5 requests per minute. If this limit is exceeded, all remaining requests during that minute return an error. Before you use the SafetyNet Attestation API, you must ensure that the correct version of Google Play services is installed on the user's device. If an incorrect version is installed, your app might stop responding after calling the API. If your app detects that an incorrect version is installed, you should ask the user to update the Google Play services app on their device. // The SafetyNet Attestation API is available. // Prompt user to update Google Play services. Transfer the response to your server. Use the response on your server, along with your other anti-abuse signals, to control your app's behavior. To keep your app responsive, execute these steps outside of your app's main execution thread. To learn more about how to create separate execution threads, see Sending operations to multiple threads. Note: The SafetyNet Attestation API uses network resources, so the latency between a request and its corresponding response varies depending on the device's network connection status. You should perform this check to protect all critical actions—including logins, purchase events and acquisition of new in-app products—in your app. Calls to the SafetyNet Attestation API incur increased latency, mobile data usage, and battery usage, however, so it makes sense to find a balance between security and usability. As an example, you might choose to request a SafetyNet attestation upon login and run re-checks at most once every 30 minutes. You can also let your server decide when your app requests an attestation, to make it harder for adversaries to predict the timing of your check. When calling the SafetyNet Attestation API, you must pass in a nonce. The resulting attestation contains this nonce, allowing you to determine that the attestation belongs to your API call and isn't replayed by an attacker. A nonce used with a SafetyNet request should be at least 16 bytes in length. You should introduce variability in your nonce, ensuring that the same nonce is never used twice. As a best practice, derive part of the nonce from the data being sent to your servers. For example, concatenate the hash of the username with the request timestamp to form the nonce. Important: Include as many pieces of data in the nonce as possible. In doing so, you make it more difficult for attackers to carry out replay attacks. For example, deriving the nonce from the username limits replay attacks to the same account. However, deriving the nonce from all the details of a purchase event limits the use of the API's response message to that purchase event alone. Upon receiving the signed response from the API, always compare the nonce in the signed response with the one you reconstruct from the rest of the message sent to your servers. This check ensures that attackers cannot reuse signed attestations harvested from good devices for other, maliciously-crafted requests. For additional information on using cryptography functions, see the guide on how to use cryptography. // Use response.getJwsResult() to get the result data. // The nonce should be at least 16 bytes in length. // You must generate the value of API_KEY in the Google APIs dashboard. The onSuccess() method indicates that communication with the service was successful, but it doesn't indicate whether the device has passed the SafetyNet attestation. The next section discusses how to read the attestation result and verify its integrity. Note: The preceding code snippet uses a non-blocking version of the attest() method. If you're making a blocking call instead, always set a response timeout. That way, your app remains responsive, even if a slow network connection causes a delayed response from the SafetyNet Attestation API. When your app communicates with SafetyNet, the service provides a response containing the result of the SafetyNet attestation and includes additional information to help you verify the integrity of the message. The result is provided as a SafetyNetApi.AttestationResponse object. Use this object's getJwsResult() method to obtain the data of the request. The response is formatted as a JSON Web Signature (JWS). Send the JWS object back to your server for validation and use. Caution: You should send the entire JWS response to your own server, using a secure connection, for verification. We don't recommend that you perform the verification directly in your app. By verifying directly in your app, you don't have any protection against attackers who may remove the verification logic from the modified version of your app, or may obstruct it from working in suitably-modified runtime environments. timestampMs: Milliseconds past the UNIX epoch when the JWS response message was generated by Google's servers. nonce: The single-use token that the calling app passes to the API. apkPackageName: The calling app's package name. ctsProfileMatch: A stricter verdict of device integrity. If the value of ctsProfileMatch is true, then the profile of the device running your app matches the profile of a device that has passed Android compatibility testing. basicIntegrity: A more lenient verdict of device integrity. If only the value of basicIntegrity is true, then the device running your app likely wasn't tampered with. However, the device hasn't necessarily passed Android compatibility testing. For more information about Android compatibility testing, see Design an Android Device and Android Compatibility and Compatibility Testing Suite (CTS). Note: If you don't need the device running your app to pass CTS, use the basicIntegrity parameter, as it allows your app to run on a wider variety of devices. If your app requires stronger device integrity guarantees, you should use only the result from ctsProfileMatch. For more information, see the potential integrity verdicts section. Caution: You should trust the APK information only if the value of ctsProfileMatch is true. error: Encoded error information relevant to the current API request. advice: A suggestion for how to get a device back into a good state. A null result indicates that the call to the service didn't complete successfully. An error parameter in the JWS indicates that an issue occurred, such as a network error or an error that an attacker feigned. Most errors are transient and should be absent if you make another call to the service. You might want to retry a few more times with increasing delays between each retry. If the device is tampered—that is, if basicIntegrity is set to false in the response—the verdict might not contain data about the calling app, such as the apkPackageName and apkCertificateDigestSha256. This occurs when our systems cannot reliably determine the calling app. What to do when the signed attestation reports an error? Retry. Errors on legitimate devices are temporary and should go away if you make another call to the service. Check that your app doesn't call the API more than 5 times per second on the affected devices and that your project's API quota hasn't been exhausted yet. Assume that it might be an attacker intentionally triggering an error case to masquerade their activity. The user should lock their device's bootloader. The user should restore their device to a clean factory ROM. You should take steps to make sure that the SafetyNet attestation response actually came from the SafetyNet service and includes data matching your request. Extract the SSL certificate chain from the JWS message. Validate the SSL certificate chain and use SSL hostname matching to verify that the leaf certificate was issued to the hostname attest.android.com. Use the certificate to verify the signature of the JWS message. Check the data of the JWS message to make sure it matches the data within your original request. In particular, make sure that the timestamp has been validated and that the nonce, package name, and hashes of the app's signing certificate(s) match the expected values. You should verify the JWS statement using standard cryptographic solutions, such as the ones found in the android-play-safetynet sample API usage, available on GitHub. During initial testing and development (but not in production), you can call an online API for verifying the signature of the JWS statement. This process has also been shown in the android-play-safetynet sample API usage made available on GitHub. Note that online verification API is solely for early-stage testing, and you have a fixed quota of 10,000 requests per day. Important: The use of the online verification API only validates that the JWS message was signed by the SafetyNet Attestation API's servers. This online API cannot verify whether the fields in the payload match the values that your service expects. We recommend planning your usage so that it takes changes and outages into account. New (experimental) fields may appear in the verdict any time. Make sure these extra fields don't break your parser or usage logic. In particular, don't rely on experimental fields before they are announced on the SafetyNet API clients mailing list. In the unlikely event of the SafetyNet Attestation API being unavailable, users of this API are strongly recommended to build server-side capabilities to dynamically control the dependence on the availability as well as quality of this API and its response. Typical strategies should include the ability to dynamically instruct your apps to stop calling this API, as well as device- and user-based whitelists to ignore the SafetyNet Attestation API results for certain classes of devices and users. For additional guidance on working with the SafetyNet APIs, view the sample code that is available on GitHub. We strongly recommend joining the SafetyNet API clients mailing list to receive updates about the SafetyNet Attestation API. Please consider providing your feedback for this API. We use your feedback to prioritize new features and capabilities for this API. By accessing or using the SafetyNet APIs, you agree to the Google APIs Terms of Service, and to these Additional Terms. Please read and understand all applicable terms and policies before accessing the APIs. As with any data collected in large volume from in-the-field observation, there is a chance of both false positives and false negatives. We are presenting the data to the best of our understanding. We extensively test our detection mechanisms to ensure accuracy, and we are committed to improving those methods over time to ensure they continue to remain accurate. You agree to comply with all applicable law, regulation, and third party rights (including without limitation laws regarding the import or export of data or software, privacy, and local laws). You will not use the APIs to encourage or promote illegal activity or violation of third party rights. You will not violate any other terms of service with Google (or its affiliates). You acknowledge and understand that the SafetyNet API works by collecting hardware and software information, such as device and application data and the results of SafetyNet attestations, and sending that data to Google for analysis. Pursuant to Section 3(d) of the Google APIs Terms of Service, you agree that if you use the APIs that it is your responsibility to provide any necessary notices or consents for the collection and sharing of this data with Google.